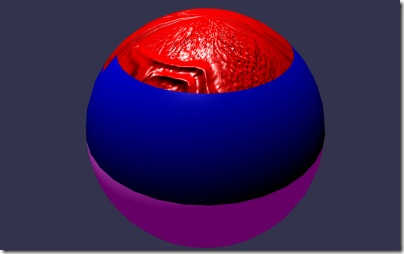 But if you do that, you will see that the sphere will only use the first submaterial (the red bumped one). This is because by default a mesh is is designed to use only one material. You can specify which part of the mesh uses a specific material by using the subMeshes property. By default, every mesh comes with only one submesh that cover the entire mesh. So with the code above, you can use the first material on the top part of the sphere, the second material on the middle part and the last material on the bottom part of the sphere. When you merge meshes together with the final parameter (multiMultiMaterial) set to true the subMeshes array is automatically created with all merging meshes' subMeshes. Each subMesh's material is also included in the resulting mesh's new multiMaterial. This feature ignores the parameter (subdivideWithSubMeshes). When you merge meshes together with the second to last parameter (subdivideWithSubMeshes) set to true the subMeshes array is automatically created with each merging mesh as a submesh of the new mesh. You must assign the correct subMesh index to the correct material index.